Thinking about renting a boat? A pontoon boat is the perfect vessel for enjoying a leisurely afternoon cruise or a trip to Crab Island. Escape from your everyday life and go Fishing on a Pontoon Boat rental from our company, located in Destin, Florida. 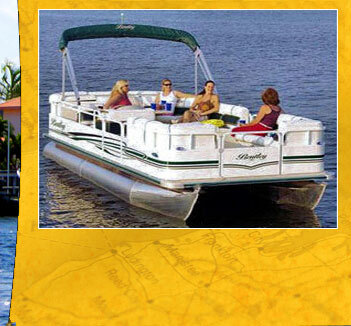 Aloha Pontoon Rentals is your source for fun on the water with top-of-the-line boat rentals. We have everything you need ready for you on your boat. Call and reserve your boat rental today. • AND…our Aloha staff will meet you at your car and assist with the loading and unloading of your belongings. Take advantage of the privacy of your own boat and relax with family and friends. Experience everything that the waters of Destin have to offer. See dolphin, have a picnic at Crab Island with the locals, or cruise the beautiful Destin Harbor. Enjoy the Elite Fleet of Aloha Rental Equipment. Call for pricing on our ½ day and full day rentals. Aloha Pontoon Rentals has jet ski rentals available for ½ an hour, hourly, ½ a day, or even daily. All of our skis can hold up to three people at a time. If you are under 22, we do offer a boater's certification class so you may enjoy the waters. Unlike other rental companies, gas is included in your rental fee, and there are no hidden charges! Catch a thrill like never before on the emerald green waters in Destin, Florida. Daily morning and afternoon excursions let you get up close and personal with dolphins and observe them in their natural habitat during feeding time. Let a local guide show you the wonders of marine life here in Destin and see why we call it "The Luckiest Fishing Village." 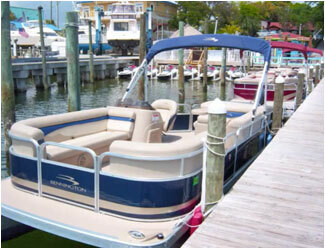 Aloha Pontoon Rentals can accommodate large groups including everything from corporate events to family reunions. We strive to provide the best experience for you and your group. Relax at our bar and grab a snowcone for the little ones or a cool one for yourself. Aloha ensures your visit will be one you never forget! 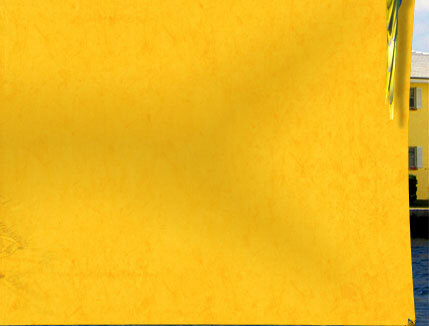 Our FAQs page will answer all your questions. Call us today for reservations or questions. Aloha Rentals is located in Beautiful Destin Harbor 100 yards east of AJ’s.